This anvil is pre WWII from the MAN Good Hope Mill Gute Hoffnungshütte (GHH)1 factory in Oberhausen Germany, the first heavy industry (founded as St. Antony in 1758) in the Ruhr region. They built large steel bridges, weapons and diesel engines during WWII. MAN facilities throughout Germany were heavily bombed by the Allies and the damage to this anvil was a result. Damage from military bombing is different than typical damage to an anvil. Notice the deep explosive impact divots in the front foot. Both horns which showed little or no signs of use were snapped off. 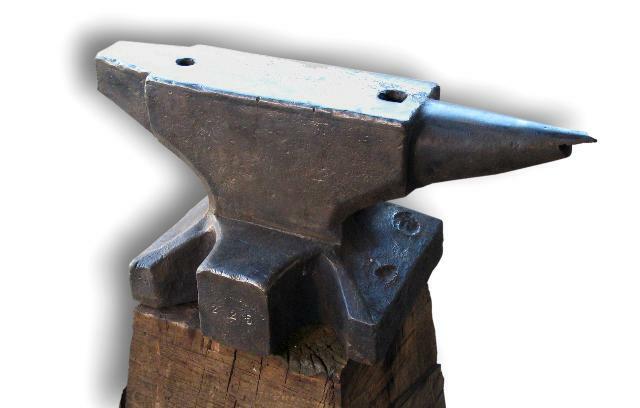 After much debate about the historical value of this anvil it was decided to repair it so that it would be usable again. Parts were forged from appropriate steel, the weld area cleaned up, then preheated and the repair parts weled on from the center out (full penetration). Then they were carefully ground to shape and blended with the surrounding material. Another WWII historical relic from Anderson Air Force Base, Guam.